"Rather than draft his replacement last offseason, the new front office spent their second overall pick - Sam Darnold, Josh Allen, Josh Rosen and Lamar Jackson all still on the board - on running back Saquon Barkley." A man of questionable intelligence was causing international havoc from the Oval Office, an all-time NFL offence was ripping through defences at a record pace, and Eli Manning was the starting QB of a New York Giants team that were going nowhere. 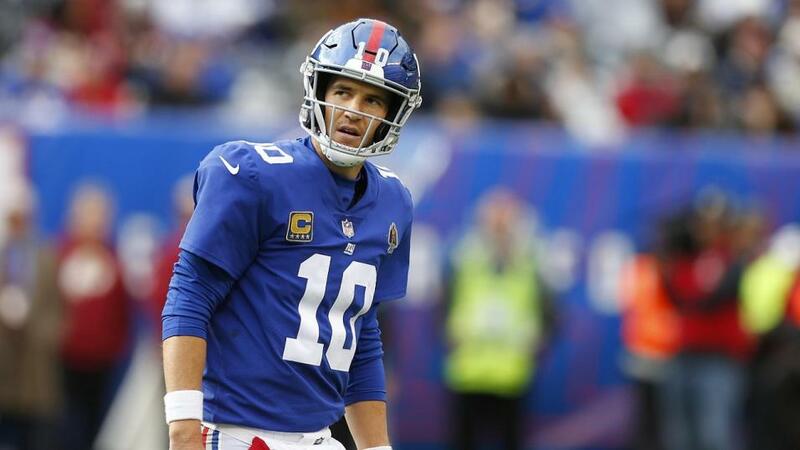 Eli's starting role for the 2018 G-Men doesn't quite trump the oddity of the presidential parallel, but it rivals New York's stunning upset of the Pats that season given how bad he was in 2017. Former coach Ben McAdoo botched the veteran's benching last season. Perhaps it's due to guilt the owners feel over that, or maybe it's because of his Old Yeller-like vibe, but the decision-makers at Metlife Stdium have continued with the young Manning QB this year. Instead of drafting his replacement, the new front office spent their 2018 second overall pick - Sam Darnold, Josh Allen, Josh Rosen and Lamar Jackson all still on the board - on running back Saquon Barkley. In their defence, it's easy to see why. He's on pace for approximately 1,800 total yards and double-digit TDs in his rookie year. The problem is everyone knows how limited the Giants are by Eli's waned powers, so defences can scheme without having to worry about much else. Just look at a break down of their quarter-by-quarter numbers. Though Manning's completing 69% of his passes, a career high, they're all in garbage time. Now, they've put together two wins and Odell Beckham says they can run the table. Eli's got some positive momentum after driving for a win against the Niners and going 16-of-17 versus Tampa's shockingly bad defence in week 11. Will it be enough to carry them to a third straigth win on Sunday? The Eagles' attempt at retaining their NFL crown is all but finished. They're a game ahead of New York in the division, but took a historic battering for a title winner against the Saints last week. They're beaten up in the secondary, and have lost some of the depth along the defensive line that made the difference in last year's playoffs. Things aren't much better on offence. They haven't had a 100 yard rusher this season after cycling through a sackful of backs. In the passing game, their explosive plays have gone. QB Carson Wentz is suffering because of injuries to the O-line and his receivers aren't making the plays they did last year. Only Zach Ertz remains a reliable target. Perhaps their biggest problem is on the sideline. Frank Reich was the OC last year, but now is head coach for the Colts, while quarterbacks coach from 2017 John DeFilippo is a coordinator for the Vikings. Without these two, the offence just doesn't look as dynamic as last season. Reich's Indy team now lead the league in converting on third down. The Eagles topped it last season. They've scored over 24 points just once this season - admittedly, against the Giants. But if they want to contend in 2019, they'll need to address these coaching losses in the offseason. I really don't like either of these teams' prospects. Talk about the Giants winning out is fine, but their "revival" is built on one fortunate, coin-toss game and one romp over a terrible Tampa D, The Eagles just aren't scoring enough. The line at 5.5 isn't as much as I'd like. The Giants have been good at covering the spread on the road this year, so they can play teams close, but I could just as easily see Philly doing what they did in week six, beating New York by 21 points. Put simply, this is a game between two unpredictable teams. With that high variance, I'd prefer to skew positive on the underdog, so would cut my usual stake and put a fraction of it on the unfancied Giants, Eli and all, to win the game ouright at [3.2]. Philly's offensive stutters cause some doubt on the 47 Total Points line, so, if you're picking a totals bet, I'd rather take the 5/6 available on over on the Sportsbook for the New York Giants Total Points at 20.5. They have plenty of playmakers, and Philadelphia's depleted defence should give them space.